I made a giant magnetic puzzle for the boys. 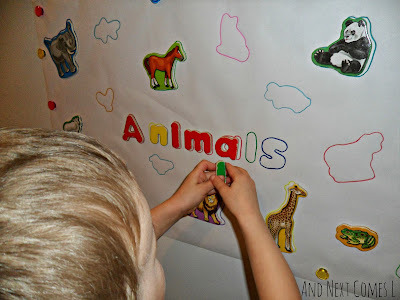 It was a great way to explore literacy, animals, colors, shapes, and so much more. When I originally came up with this idea, I did a dinosaur themed one for our homeschool preschool co-op and it was a huge hit. This puzzle is super easy to make and can be used to fit any theme your child likes. Click to read the full post on B-Inspired Mama.